Periodically on The Zen Girl Chronicles, I feature a woman that lives an inspired life, following her bliss every single day. For June 2012, I chose the lovely Rachel Brathen as our "Zen Girl of the Month" because of her courage to live out her dreams. As a teen, Rachel left her native Sweden in search of a better life, and found yoga - which helped her find herself. "Go where the happiness is, and screw everything else." At only 23-years-old, Rachel Brathen has created quite the beautiful life for herself. Leaving her native Sweden in search of escape and adventure, she found herself on a tiny island, sharing her love of yoga and life with anyone who would listen. Now, four years later, she has developed a loyal following of fans online who can’t get enough of her genuine nature and famous “handstand posts.” But life wasn’t always so magical. She traveled a hard road to get to where she is today. 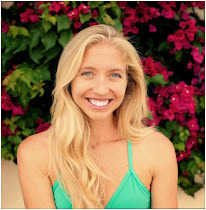 In this interview, Rachel takes a break from paradise to share her journey and what it took for this Zen Girl to follow her bliss. 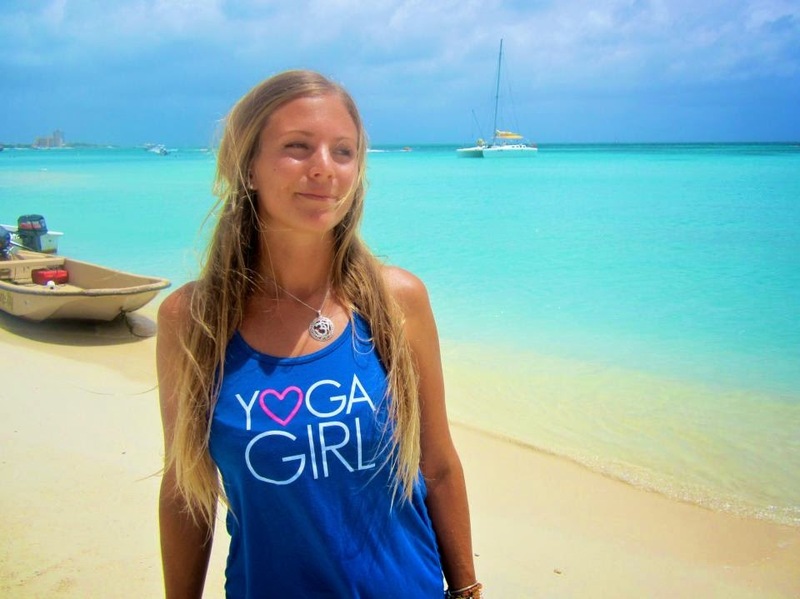 Rachel Brathen, Yoga teacher, SUP Yoga pioneer, Yoga Director of Manchebo Beach Resort & Spa in Aruba. And beach bum. Wake up around 6am, drink tea, eat a mango from our mango tree (it's mango season here! ), then drive to the resort where I work. I teach yoga almost every morning (15-20 classes a week), and usually do my own practice before class. I teach a one hour class in the morning, with a mix of locals and tourists. I usually have breakfast at the hotel. After that I go home, change into my bikini and take the dogs to the north shore for a long walk or a run. We live very close to the north shore of the island, and it's absolutely magical - cliffs and desert and cacti and ocean and little deserted beaches. I am in the water at some point every day. After I’ve dropped the dogs off back home, I either go do some work at home, at the hotel, or in my boyfriend’s skate shop. As the Yoga Director of a wellness resort, I have some administrative work that needs to be taken care of, but I can do that pretty much from anywhere. Depending on the day, I usually have a SUP Yoga class in the afternoon, in which case I go to the beach again, but on the south side of the island. SUP Yoga (Stand-Up Paddleboard Yoga) classes are 90 minutes, including teaching paddle techniques, paddling to our yoga spot, and the actual practice. These are my favorite classes; ocean, beach, yoga, surf... All in one! After SUP class, I try to stick around on the beach, maybe do a long distance paddle or just swim. I'm a beach bum at heart. Evenings, I spend with my boyfriend and our pups. If I don't have late night class (three nights a week), then I'm cooking, reading and watching a movie. We are big foodies and like to go out for dinners whenever we can - Aruba has so much to offer. Also, sunset walks with the dogs daily. Pretty much - yoga, beach, work... That's my day! What is the first big (or little) step you took to follow your bliss and create this beautiful life that you have? The first step I took - I decided, I did not want to live my life being miserable. I spent so many years half-assing my life, worrying about the future, the past, even the present. "Was I good enough, pretty enough, thin enough, smart enough?" I was so insecure in my own skin. There was a lot of pressure where I grew up (Sweden) to be "perfect" - most of that pressure coming from myself, I know now - and I spent so much time worrying what others cared of me. I wasn't happy at all. I had some pretty serious traumas growing up, sadness, deaths, just life, pretty much... but it all lived inside me, and I didn't realize I was living my life half-asleep. There was always that thought in my head; after I do this or reach that, I'll be happy. But that place never came, and after some really difficult years, one day, I had enough. I realized that tomorrow is not real; it's something I'm creating in my head to make my day more bearable. If I can't be happy now, then when? When is the time? For me, this realization changed my life. I finally got it - I need to live my life, not think about living it. This brought a huge need of experiencing something new, to get away, and I ended up leaving my home country to travel the world. Taking that first step was crucial, and I now know that I needed all that suffering to get here. Those hard years in my teens were so, so important - you need to fully see your darkness to desire the light. Yes, I had a lot of sad things happen when I was younger (who doesn't? ), but I no longer think of them as things that happened "to" me. Things happen for you, not to you - and you need every experience that comes your way. Embrace! As soon as I opened up to a new way of living...happiness came. Little by little, I started to let go of the things from my past that were weighing me down. Yoga came into my life around that same time, and for the first time in my life, I got a tool to see my body as what it really is: Limitless! The body does so much for us, and it's the first thing to go when we're not feeling OK. Take care of it. Love it. Every inch! I also no longer judge myself the way I used to. I literally have not stepped on a scale since I was 17. I look the way I look, and I am the way I am. What's important is that I like myself, not what other people think. For me that was a huge thing, and yoga has helped me realize that. Moving my body with the breath, residing in the here and now, allowing the mind to rest - so important. 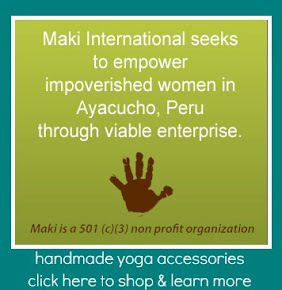 Plus, yoga is so empowering! I'm strong, spacious, and present on the mat. There is no end to what we can create when we open up to what’s already here. Letting go of past hurts and fear, it's something we can actually do right now. Give it a go on the mat - we carry so much in our bodies. In my first year of yoga practice, I cried pretty much every time I stepped onto the mat. So wonderful... just thinking about it makes me smile. Crying is good! Letting go is good! Let everything go. How else can you fully immerse yourself in the present moment? Beauty is here and now. Life is now. And life is pretty damn amazing, I'll tell you that. What is your advice to people in overcoming fear and following their bliss? The most important advice I could ever give - we need to let go of our past to embrace what's ahead. It's so true - most of us live with a lot of skeletons in our closets, and we need to face them. Don’t let your past decide your present. Be here, now. If you're faced with an opportunity - take it! If you have a dream, go for it! What do you really have to lose? My dream is living in paradise, sharing my knowledge of yoga, in love. I get to live all of that and I am grateful every single day of my life. Go where the happiness is, and screw everything else.